Hello, From PhotosMadeEz, Where We Capture Smiles, One Shot at a Time. The Wedding Day is the most awaited day in any girl’s life and every bride wants to look her “wedding best”. 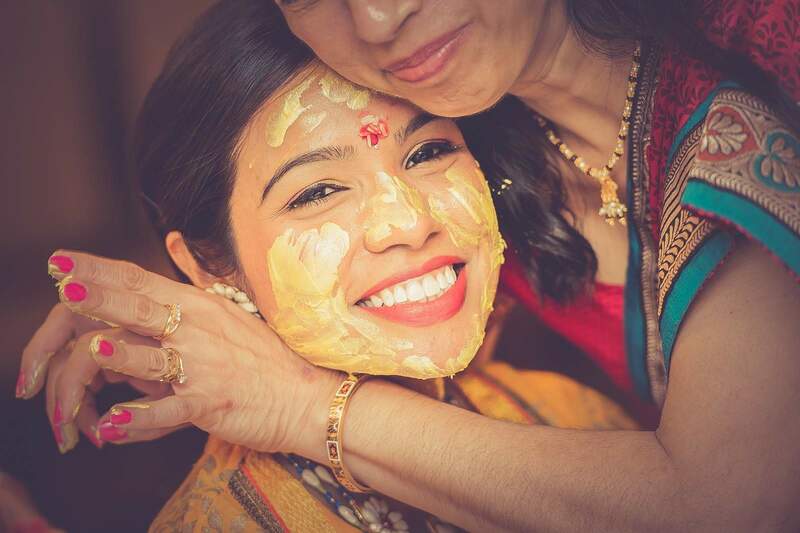 In earlier times, when the concept of beauty parlors and salons were not prevalent in the society, the ritual of haldi was performed to bring glow to the faces of the bride and the groom. A paste of turmeric, milk, almond oil and sandalwood powder is made and applied to the bride and groom. The paste serves as a cleanser for the body and soul and signifies the bride’s preparation and welcoming into adult married life. An Indiawedding is a week-long festival for the family and the ritual of ‘ Haldi ‘ takes place just a day prior to the wedding. Haldi (also known as turmeric) is considered to possess high medicinal value too. The haldi in some Indian communities also signifies protection, hence why the couple cannot leave the house after the ceremony. The ritual of haldi takes place in many Indian traditions prior to the wedding day. The ceremony is considered to be very auspicious and special for both the bride and the groom as it prepares them for the big-day they had been eagerly waiting for. All the close relatives enthusiastically take part in the ceremony and tease the bride n the groom by putting the haldi paste on their cheeks, feet, forehead, arms and nose. Punjabi Weddings have a similar tradition called the “Maiya” done at the bride and groom’s family respectively. “Pithi Ceremony” is celebrated prior to the GujaratiWedding. According to an old saying if somebody rubs pithi on any unmarried person, he or she gets married soon. “Gaye Holud” is a tradition in Bengali Wedding. The “Haldi Kumkum” ceremony is particularly popular in Maharastrian Weddings, Goanese Weddings and some South Indian Weddings. So how should you dress for the Haldi Ceremony? Please dont wear beat up clothes….its your wedding 🙂 We, at PhotosMadeEz, suggest you wear Indian clothes and jewerlry which will add to your wedding day but it wont hurt your pocket. Do you wear make up? Why not? A light make up always helps. If you want the out of the box photo jouranlism from PhotosMadeEz, just relax enjoy all the funs of the Wedding. We will make sure your album will have all the beautiful candid photos that you would absolutely love.